I was born and raised in Kindersley, Saskatchewan and graduated from Kindersley Composite School in 2012. I am currently studying the clarinet here at the BU School of Music. In high school, I competed in the local music festival every year, and I had the opportunity of competing at the provincial level in Saskatchewan three times. I placed first in the provincial intermediate woodwind category for 2 consecutive years. I was also able to compose and perform a piece for the Lieutenant Governor of Saskatchewan when he travelled to my hometown in 2010. In addition, I was a member of the National Youth Band of Canada in 2012, 2014, and will have the honour once again this May. This year I am excited to be involved in the university as the music coordinator for BU’s Varsity Christian Fellowship club, as well as reaching out to the community by assistant directing the Care Home Outreach Project, bringing music to residents of Brandon’s care homes. My hometown, Kindersley, is a small Saskatchewan town of about 5000 people. I am abundantly blessed to have the family that I have. My parents gave me a head start in music; my mom started teaching me piano before I could read words, and I have a distinct memory of my dad teaching me “Go Tell Aunt Rhode” on the recorder in grade four. I have two awesome younger brothers and a wonderful younger sister, all of whom also play musical instruments. It all started with my music teacher way back in grade five. I still remember the day I got my first clarinet—it was very exciting! Band was always my favourite subject in school. 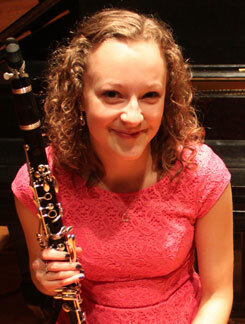 I worked hard at playing the clarinet, and took private lessons all throughout high school. It was the people in my life, my teachers who are passionate about music, who really inspired me to pursue music. They have encouraged me throughout my journey and continue to cheer me on to this day. My faith is a huge part of my life. I don’t know how I would have made it through the hard times in my life without my Heavenly Father. I believe that loving others is the most important thing, no matter who they are or what they believe. Perseverance, hard work, optimism, trustworthiness, and continuous learning, are a few other things I believe are important life skills. Playing in a professional orchestra has been a dream of mine. I can also see myself as a music teacher or maybe even a music therapist in the future. Other dreams of mine are to travel, and to have a family of my own. My colleagues recognize Vanessa’s academic excellence and professionalism. They have told me that she is one of the top students in their courses and a pleasure to teach as she actively contributes to meaningful discussions in class. Vanessa deserves recognition for her leadership and achievements.